Let me ask you a very quick question. … Would YOU be interested? … Now these are benefits that EVERYONE would love to experience, right?But only a handful of individuals do.Why?Because achieving these awesome gains takes YEARS of meditation. It requires a level of dedication far beyond ANY other self-development project you’ve ever undertaken.Meditation can be really, REALLY tough.Or it can be really, REALLY easy.How?With “The Meditation Program” – the world’s most technologically-advanced meditation program. Using it’s special audio technology, The Meditation Program will literally meditate FOR YOU.No more BOREDOM. No more YEARS of training.Interested? Then, please – let me tell you more. I’m Hale Carlton – and I’d really like to welcome you to this site!I’m the creator of Sleep Programming – and the man behind the powerful brainwave technology found in many other products, including Binaural Beats and Subliminal CDs.I’ve created brainwave material for Subliminal Studio and Brainwave Generator. 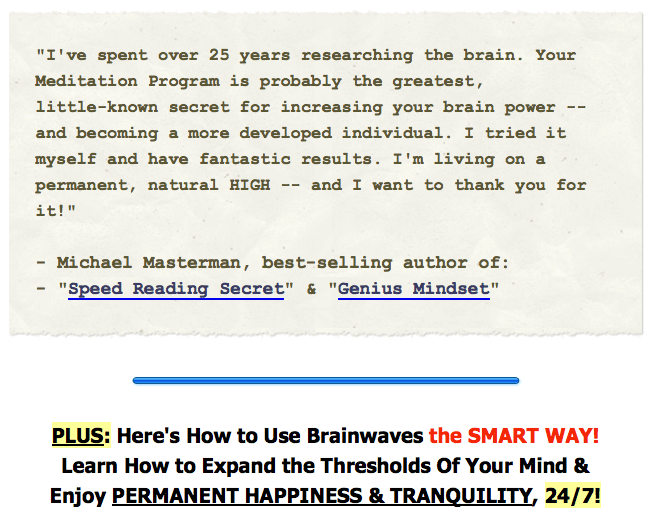 And I’ve studied everything from Basic Brainwave Patterns to Advanced Neurotechnology – usually just for fun!Yes – I know about BRAINWAVES.And I also know how to use brainwaves to help tap into the DEEPEST MODES of MEDITATION – and experience profound levels of relaxation and insight – WITHOUT ANY EFFORT WHATSOEVER.Let me explain…Your brain operates at certain frequencies, depending on what it’s doing. You’ve probably heard of Beta, Alpha, Theta and Delta brainwaves before.When you’re sleeping, you’re in Delta. Right now, you’re in Beta.And when you begin meditating, you start delving into lower Alpha. After you’ve been meditating for years, you start to be able to reach newer, more powerful depths – levels of deep Alpha, deep Theta, and even upper Delta.Those are the LEVELS where you’ll begin to experience PROFOUND benefits!I’m talking about stuff you won’t even BELIEVE until you’ve experienced it. Insights. Healing. Blissful happiness. Spiritual connectedness. It’s awesome.But it can take YEARS — if not a WHOLE LIFETIME of daily meditation — to reach those depths.However…There’s ALSO a way to achieve those sorts of depths WITHOUT having to commit years of your life to hours of daily meditation.How?By using “binaural beats,” a technique discovered in 1839 by German research scientist, Heinrich Wilhelm Dove.So, what is a “binaural beat”?Well, it’s a process of playing slightly different frequencies into the left and right ear, which generates a third frequency inside the mind (the “binaural beat”).The brain then automatically “follows” this frequency – and puts you into that state of mind. (Read more about the science here. )For example, when you’re sleeping, your brainwaves are in Delta. By listening to a CD containing a low Delta binaural beat frequency, you’ll probably fall asleep QUICKLY! Even if you’re wide awake! That’s what Bradley Thompson famously did with his Sleep Deprivation CD.And by listening to deep Alpha, deep Theta and upper Delta frequencies, you’ll be able to quickly replicate states of DEEP MEDITATION…TOTAL relaxation… ultimate ZEN-LIKE meditation… increased ENDORPHINS… increased MEMORY functions… awesome INSIGHTS… WHOLE BRAIN thinking… self-development BREAKTHROUGHS … and MUCH MORE! !Wow!Do you see just how POWERFUL brainwaves can be in helping you to tap into the TRUE power of meditation – VERY QUICKLY?But that’s just the beginning… Yes, influencing your brainwaves can be incredibly powerful.But the effects are short-lived.Once you’ve finished listening to the binaural beat recording, you return back to the daily confusion of life — and everything seems a little foggy again. The benefits are TEMPORARY.But there’s an EVEN SMARTER way to use binaural beats….By consistently experiencing DEEPER and DEEPER FREQUENCIES, and following a set listening plan, you begin to EXPAND the THRESHOLD of your MIND.All of those wonderful short-term benefits become available to you… 24/7!By expanding the threshold of your mind, you’ll begin enjoying QUANTUM LEAPS in your self-development — and EMOTIONAL BREAKTHROUGHS beyond your wildest dreams.Let me explain what I mean…Everyone’s mind has a certain threshold, determined within the first few years of your birth. That threshold establishes how much your mind can “handle” at any one time.When the mind is overloaded, it uses a variety of self-sabotaging techniques to help “cope.” Such as substance abuse, anger, fear, addictive patterns, negative behaviours, mental health issues, emotional issues – and more.But that threshold can be expanded through the process of meditation.Let me give you an example.Imagine a cross-country runner.In the early days of training, running five miles may seem absolutely impossible. Unbearable. Overwhelming. But after a few weeks of training, the body muscles develop – and what was once impossible, becomes the norm.The threshold of the muscle expands to adapt. The problems of the past simply drop away.That’s EXACTLY how the brain works!Through the process of meditation, you expand the threshold of your mind – giving it more “space” to operate, and automatically releasing negative self-sabotaging habits along the way. Your addictions and fears just drop away. Problems simply disappear. You feel GREAT!It’s the ULTIMATE GOAL of meditation.And that’s precisely what “The Meditation Program” does for you.It includes a series of levels, each designed to take you deeper and deeper, expanding the threshold of your mind – and bringing you a greater sense of peace and understanding with each session.You’ll feel the benefits that take others YEARS to achieve – in just MINUTES!And by following our set listening plan, those AMAZING BENEFITS soon become permanent.Interested? 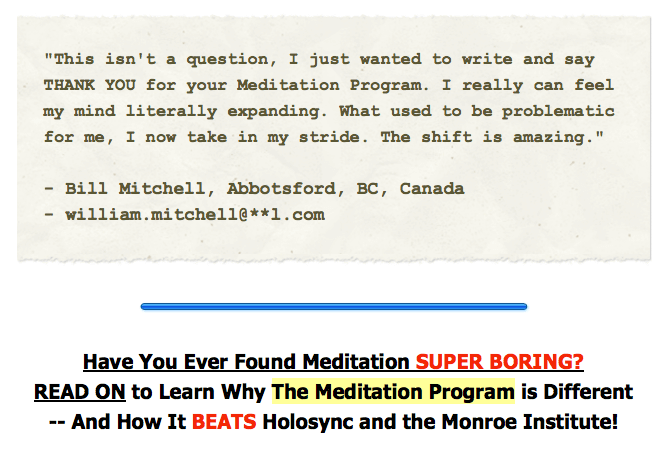 Now, if you’re anything like me, you’ll know one thing…Meditation can be both BORING and LONG-WINDED.Maybe you’ve already tried other brainwave meditation products, such as Centerpointe’s Holosync program, or products from the Monroe Institute.In which case, you may have discovered just how MIND-NUMBING, DIS-ENGAGING and OUTDATED these programs really are.It would seem there’s NO SOLUTION.That’s why 10 years ago, I began to think…What if there was a meditation program you could actually LOOK FORWARD to?What if you could stop looking at meditation as a dull, boring, back-aching process – and start to GET EXCITED about your next session?I mean, REALLY EXCITED. 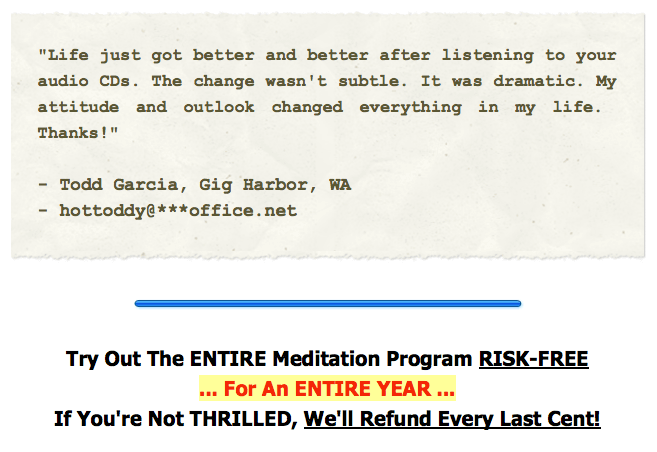 Like, you’re THRILLED because you know you’re touching upon something magical – and knowing it’s making fantastic change in your life.Wouldn’t THAT make a difference?Well, that’s exactly what I thought – when I decided to create an early version of “The Meditation Program,” just under 10 years ago.It was only a prototype of our current meditation program, but – WOW – was it powerful!Our Australian-based “Deep Brainwaves” team began experimenting with the technology, and were immediately startled by it’s phenomenal success –Users reported being able to enter DEEP STATES of MEDITATION within just MINUTES.But that wasn’t all.They also experienced huge endorphin rushes. Shamanic-like visions. Curious physical sensations. Universal and psychic insights. A feeling of “oneness” with everything. Hours of blissful meditation seeming like just minutes. Solutions to complex problems. Reduced sleeping hours.And LONG-STANDING PROBLEMS and ISSUES began to simply DROP AWAY.Seriously.As the thresholds of their mind began to expand, issues that had previously troubled them for YEARS, simply vanished.It was an EXCITING TIME.We continued to test and refine the entire process. Before we knew it, thousands of individuals were involved in the process – and “The Meditation Program” began to receive large-scale recognition, especially in Australia.By combining some of the most advanced brainwave research, and stunning audio soundscapes, we’ve finally decided to unleash the ENTIRE meditation program to the self-development community – FOR THE FIRST TIME EVER.And now YOU can experience it for yourself – from the comfort of your own home! Let me ask you a simple question.If you wanted to travel from coast to coast, would you prefer to take a slow, cumbersome bicycle –– Or would you prefer to DRIVE across the country using the FASTEST and MOST RELIABLE vehicle available? With integrated satellite navigation and a body designed for all terrain?Obviously, unless you want to experience problems, you’d use that top-of-the-range VEHICLE.Well, that’s like saying if you want to experience the amazing benefits we’ve been talking about – including awesome self-development, inner peace and happiness, and great brain power –– Then would you prefer to simply MEDITATE (over years and years), or would you like to experience the turbo-speed, brainwave-charged MEDITATION PROGRAM?I hope you’d choose the more ADVANCED, more POWERFUL option. The Meditation Program is a state of the art brainwave “entrainment” package that guarantees to shift your self-development and meditation straight to the next level.It consists of EIGHT brilliantly-composed levels, each taking you deeper than the last. Each level is designed to be listened to for at least a week, at which point you move onto the next level.Levels 1 to 4 begin expanding the threshold of your mind, gradually exploring the deepest states of Alpha. Levels 5 to 7 cover deep Theta and early Delta. And Level 8 expands your mind into the mid-Delta stage.And when you reach that mid-Delta frequency (of around 2.5 Hz), you’ll be experiencing the MOST POWERFUL MEDITATION AVAILABLE – something that typically takes YEARS to ACHIEVE!We’ve used The Meditation Program with over 10,000 participants throughout the globe and they’ve ALL reported phenomenal success. We’ve recorded and analyzed the results using EEG machines – and these recordings create AWESOME shifts in the mind that bring about PROFOUND CHANGE.And rather than simply containing the sounds of rain, like most competing products, each level in The Meditation Program contains a unique, deep and powerful soundtrack compiled by industry-leading composer, M. Anton.These recordings will GRAB your attention – and because they’re more INSPIRING and INVIGORATING than any meditation sessions you’ve ever heard before, they’ll literally KEEP YOU INTERESTED…… And you won’t BELIEVE the benefits you’ll experience!You’ll instantly begin to feel more refreshed, more ALIVE, more confident, more powerful, more “in control”, more spiritual – and more grounded.Why are they so powerful?Because The Meditation Program is fully in-line with the very latest brainwave research, and incorporates some of the most powerful brainwave technology available (for example, it utilizes monaural beats as well as binaural beats – meaning you can listen with and without headphones! ).Compare us to our competitors – who are using audio ported from cassette tapes (with a great loss of quality), and using recording methods based on research 15 years OUT-OF-DATE!Meditation is changing. So, are you interested in test-driving the MERCEDES of MEDITATION?Remember, with The Meditation Program, you can enjoy temporary results INSTANTLY.For more permanent results, we require a small time commitment from your side. At minimum, we’re talking half-an-hour a few times each week. However we’d recommend an hour a day where possible.And it’ll take between at least two months to finish the entire program.But it WON’T feel like a HASSLE.This will be the most enjoyable, the most interactive and MOST FUN journey into self-development you’ve ever experienced.You’ll experience PROFOUND CHANGE that will replace YEARS of THERAPY.Make QUANTUM LEAPS in your self-development… LET GO of destructive habits and problems… Increase your brain’s natural “HAPPY” chemicals… RESOLVE emotional issues from your past… Begin “WHOLE BRAIN” thinking… REDUCE the amount of SLEEP you need each night… Experience universal INSIGHTS and visions… Increase your INTUITION…All of this can be YOURS – when you discover “The Meditation Program.”Interested? 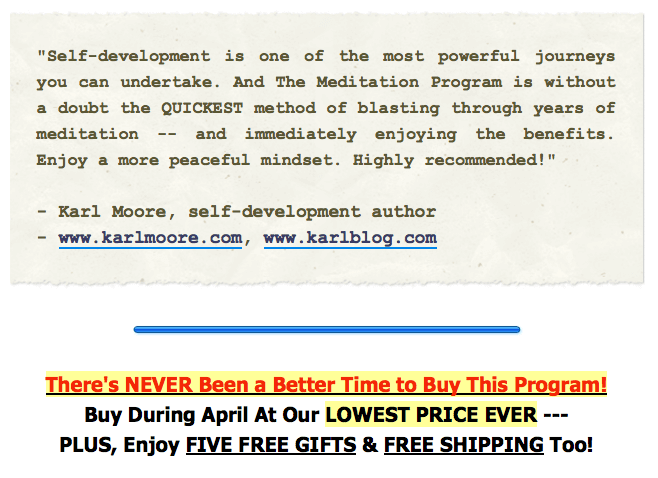 Want to begin experiencing the TRUE POWER of meditation – starting TODAY?During the month of April, we’re running a special promotion allowing you to purchase the ENTIRE Meditation Program at our LOWEST PRICE EVER!That’s right – there’s NEVER been a better time to sample The Meditation Program.If you decide to purchase the CD version of The Meditation Program, you’ll be able to grab your copy TODAY – for just $125, with 100% FREE international shipping and handling. (That’s around [PRICE-USD125.00-INGBP] or [PRICE-USD125.00-INEUR]. )Or if you wish to purchase the downloadable version of The Meditation Program, you can access your copy TONIGHT – for a TINY $85, with NO extra fees. (That’s around [PRICE-USD85.00-INGBP] or [PRICE-USD85.00-INEUR]. )Our usual retail price is $295 for the entire course, with shipping as an extra cost – BUT if you purchase TODAY, you’ll be able to access EVERYTHING for this low one-time fee.That’s LESS than the cost of two nights in a dirty, flea-infested motel. And it’s a TINY PRICE to pay for PROFOUND INNER PEACE – and the sort of amazing benefits we’ve been chatting about on this page.We’re talking just 30 cents a day over the course of the ENTIRE PROGRAM. And remember, you’ll receive EVERYTHING – and you can use the materials over and over again. 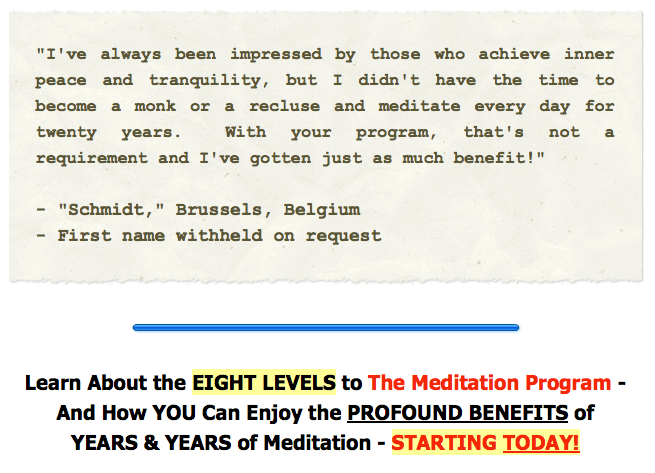 Once you reach Level 8, you’ll be able to LISTEN AS LITTLE as a couple of times a month – and continue experiencing HUGE BENEFITS.It’s an AMAZING MEDITATION PACKAGE, it can replace THOUSANDS in THERAPY — and it can be YOURS, starting TODAY… So, would YOU like to experience the entire Meditation Program –– Absolutely RISK-FREE?As part of our commitment to ensuring every single customer is ECSTATIC with The Meditation Program, we’re offering you a ONE-YEAR RISK-FREE TRIAL!That’s right – you can literally order the course and try it out in the comfort of your own home for ONE WHOLE YEAR.Here’s our EXCLUSIVE GUARANTEE, backed by our publishers, the Self Development Network…Try it out!The Meditation Program will absolutely BLOW YOU AWAY – it’s unlike ANYTHING you’ve ever seen before.And best of all – it’s available to YOU, RISK-FREE, right now.So if YOU’D like to begin meditating deeper than a Zen Monk… If YOU’D like to uncover why everyone says meditation is SO critical… If YOU’D like to discover the SHORTCUT to whole brain thinking and emotional happiness… If YOU’D like to gain insights into the universe… If YOU’D like to release the baggage you’ve been carrying around with you for so long… If YOU’D like to drop addictions and fears… If YOU’D like to become a happier individual, enjoying a natural LIFE HIGH 24/7…… Then it’s about time you discovered The Meditation Program!Take advantage of YEARS of research, an all-time LOW price, a ONE YEAR guarantee, and FIVE FREE GIFTS – right now. Gain INSIGHTS into the whole universe – Enter the deepest levels of your mind, and experience creativity, ideas and visualizations like NEVER before! Achieve insights into the universe never before possible without YEARS of meditation! Expand your mind, ROCKET your IQ – Activate “whole brain thinking” – and rapidly increase your intelligence. Become super creative and find solutions to problems that have BAFFLED everyone else. Take HUGE LEAPS in your self-development – Meditation has long been known as the most important tool you can use to aid your self growth. What if you could quickly use meditation to let go of all of your “issues”? Why buy a bottle of pills? – Release stress, uncover profound new levels of inner peace – and increase production of serotonin, and other natural brain feel-good chemicals. Smile and feel great about yourself, all the time! Dissolve ALL unwanted emotional baggage – Wave goodbye to all emotional baggage once and for all. No more depression, substance abuse, anger, fear, uncontrollable feelings and urges – and more. It’s easy! The entire Meditation Program consists of SIX separate CDs, or is available as EIGHT separate downloads. Listen to a montage sample here. FULL Meditation Program GuideYou’ll receive full access to our Meditation Program guide, where you’ll discover exactly how to get started in the quickest time possible – and how to use the entire program for MAXIMUM RESULTS!The guide also explains everything from how the Meditation Program works to the truths behind binaural beats, from whole brain thinking to correcting chemical imbalances. You’ll never be stuck for help. And it’s all included as part of your package! 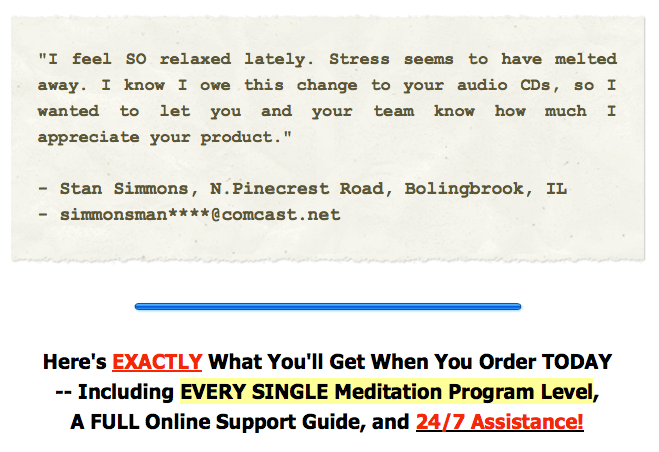 COMPLETE Online Support PackageEveryone has questions from time to time, especially when it comes to meditation. That’s why our SPECIALIST TEAM is always at hand to answer your questions.Ask for advice on how to use the program, how to overcome any stumbling blocks you may be experiencing – and where to move on after you’ve finished the program. Our team is available around the clock via our support site, and are regularly on tap via online chat. 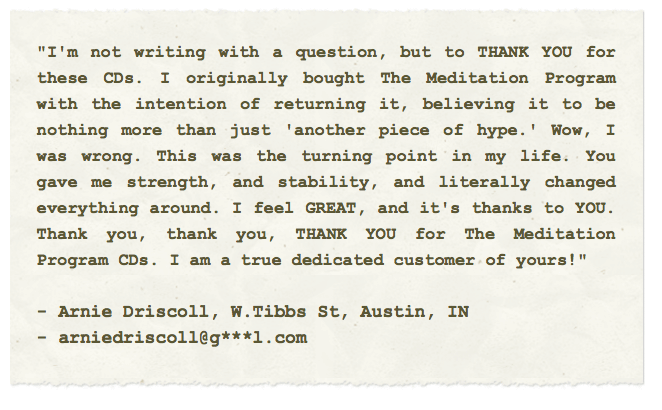 We promise to go that EXTRA STEP to ensure you’re totally ecstatic with The Meditation Program! But you don’t, because you find it BORING… and you don’t feel you really experience any GAINS from the whole process? If so, then you’re not alone – and The Meditation Program is absolutely the right kit for you. It’s the FAST TRACK to TOTAL SELF-DEVELOPMENT! Quantum BREAKTHROUGHS in your self-development regime! REDUCE the amount of time you need to SLEEP each night! … Then you owe it to yourself to discover The Meditation Program TODAY.There’s never been a better time. Click on the button to grab YOUR copy, right away!